This is an exact word for word excerpt from the new h2h rules that Wiz Kids posted on April 14th. Head-to-Head Tournaments are played on a standard 3' x 3' playing surface. Only Standard Terrain Templates are tournament legal, including Special Terrain (Shallow Water, Deep Water and Low Walls). Elevated terrain may not be used. Standard Terrain Templates are available for download from our web site at www.mageknight.com. 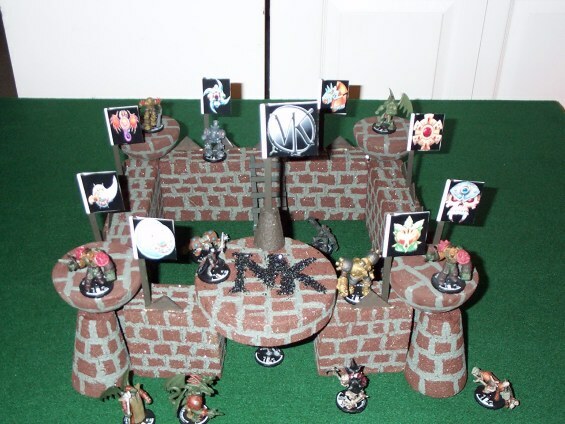 Each player must bring four pieces of terrain to the tournament. Both players place their terrain in a pool (totaling eight pieces), from which four pieces of terrain are selected using Setting the Scene rules on page 3 of the Mage Knight rule book. No terrain may be placed in an opponent's Starting Area, or within 2" of another terrain piece, or within 2" of a battlefield edge. So by the way it looks any terrain that you made is no longer tourney legal. :-( Demo has declared that you can 3-dimentionalize the terrain templates as long as they don't impede game play in any way. Here is where I will be posting terrain building tips and instructions. Here is a picture sent to me by Catnshel. He made it with styrofoam that was purchased from Hobby Lobby, painted all the pieces first then carved the lines for the bricks and painted in the mortar and used Toothpicks and Styrofoam glue to assemble it. If you look close you will notice a that he used the "new" fraction art work for the flags. I don't know if he glued the rock on to make the MK symbol or if it is temporary.